MyPhone T18 Duo Price Php 1,999 : Silent Best-Seller?! What's So Special About It? Snobs aren't allowed in TP! Here in TechPinas, we cover gadgets in ALL price categories -- from the most expensive to the most affordable. I was walking around SM North EDSA Annex last Wednesday when I saw a number of students lining up at the MyPhone booth to grab this phone. 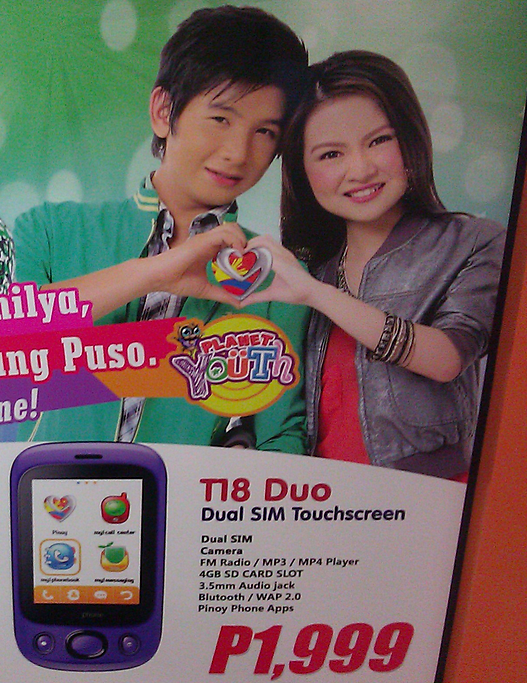 "Yung MyPhone T18 PinoyPhone po," they told the sales ladies. I got curious so I watched a few of them unbox their units to see for myself what makes this phone sell. Turns out, there's nothing really special about its looks, accessories nor its specifications; Typical Dual SIM 2.4-inch resistive touchscreen phone with 0.3 MegaPixel camera and MP3 music player, comes with earphones, battery, USB connector and manuals. Typical. Baffled, I asked one of the students, "Bakit yan ang binili mo? Maganda ba? (Why did you buy it? Is it good?)" "Pinakamatibay po kasi ang MyPhone sa local, (MyPhone is the most durable of all local brands)" he answered. I wonder just how much MyPhone's Kapamilya and Kapuso celebrity endorsements are affecting the decision of consumers. Since buyers aren't likely to disclose what's really in their minds, I guess the sales figures will just have to speak for themselves.